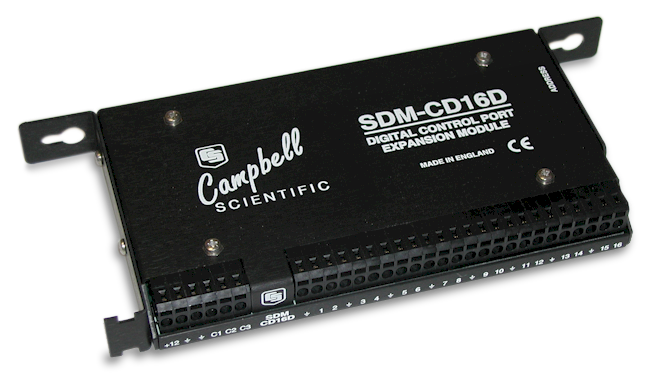 The SDM-CD16D increases the number of digital outputs that can be controlled by a Campbell Scientific datalogger. The SDM-CD16D is commonly used to drive normal logic level inputs. The SDM-CD16D increases the number of digital outputs that can be controlled (i.e., set to 0 or 5 V) by a Campbell Scientific datalogger. In addition to being able to drive normal logic level inputs, when an output is set HI, a boost circuit allows it to source a current of up to 100 mA for controlling low voltage valves, relays, or other devices. Up to 15 SDM-CD16Ds may be addressed, making it possible to control a maximum of 240 ports from the first three datalogger control ports. EMC Status Complies with EN55022-1:1998. and EN50082-1:1998. CR3000 For the CR3000, SDMs are connected to the ports labeled SDM-C1, SDM-C2, and SDM-C3. CR5000 (retired) For the CR5000, SDMs are connected to the ports labeled SDM-C1, SDM-C2, and SDM-C3. Up to 15 SDM devices can be connected to a single data logger. To communicate with connected SDM devices, the CR3000 and CR5000 use the SDM-C1, SDM-C2, and SDM-C3 ports. The other data loggers use ports labeled C1, C2, and C3. The 21X also requires channel 1H. The SDMCD16AC Instruction controls SDM-CD16D operation in CRBasic. Edlog Instruction 29 controls SDM-CD16D operation in the CR7, and Edlog Instruction 104 controls SDM-CD16D operation in the CR10(X), CR23X, and 21X data loggers. The maximum output current that the SDM-CD16D can source is 400 mA. The power requirements are large compared to most Campbell Scientific products when driving significant loads. For many applications, an external rechargeable power supply is recommended to power the SDM-CD16D. This power supply should share a common grounding point with the data logger. For some applications, the data logger's sealed rechargeable battery may suffice; in this case, float-charging the batteries from an ac source is recommended. The SDM-CD16D requires a desiccated, non-condensing environment; a Campbell Scientific enclosure is recommended. Grommets and screws are provided to attach the flanges/bracket to the backplate of our enclosures.